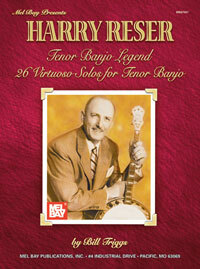 HARRY RESER TENOR BANJO LEGEND. 26 Virtuoso Solos for Tenor Banjo. TENOR BANJO MELODY CHORD PLAYING SYSTEM. COMPLETE GUIDE TO LEARNING THE IRISH TENOR BANJO. WITH CD. COMPLETE TENOR BANJO METHOD. BEST SELLER. AN ALBUM OF RAGTIME TENOR BANJO SOLOS. WRITTEN IN NOTATION AND TAB. AN ALBUM OF RAGTIME TENOR BANJO SOLOS. BOOK 2. WRITTEN IN NOTATION & TAB.